Information → Automatic Updates: Tick this box to receive a reminder email when updates are available for the Genesis Framework. Custom Feeds: this setting works OK, don’t change it unless you know what you’re doing. Some themes only have one option, full width layout with NO sidebars. The default setting that you choose here will be automatically used for new pages and posts. But! You can choose any of the options available in your theme when you save each individual post or page that you make. Add a search form or twitter link to your primary navigation bar. These are not available in all themes. Check to see if this setting is available in your theme. The two options you’re most likely to want to use are the search form and the twitter link. Experiment and see if they’re suitable for your site. Don’t confuse breadcrumbs with Post Info and Post Meta. Breadcrumbs can be a useful navigation device for your site visitors. If you have a large blog with several categories. I recommend you turn breadcrumbs on for Single Posts. Experiment to see what suits your site. This is a global setting. If you turn comments and trackbacks off here, you can NOT enable them on individual posts or pages. If you want to turn comments and trackbacks off throughout your entire site, this is a quick and easy way to do it. To make it easy for visitors to find all of the content on your site you need to provide web pages that list of all your blog posts. Site visitors browse through these lists and click a link to see the individual blog posts. 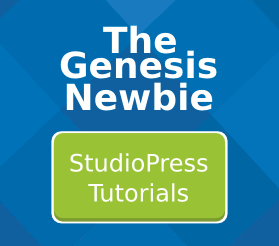 Genesis provides several options when you make these blog listing pages. Show the full content of each blog post. Show a short teaser text with a link to the full post. Show the first few paragraphs of each post including images in the posts. Show the full text from the posts but strip out the images. You can include or exclude featured images and choose their size. And you can choose the style of buttons that link these listing pages together. Entry content + 0 characters + more tag + Featured Images= Duplicate images! This is a simple rule. If you use the Entry Content setting with 0 Characters limit, do not tick the “Include Featured Image” box. This avoids displaying duplicate images on your blog listing pages. 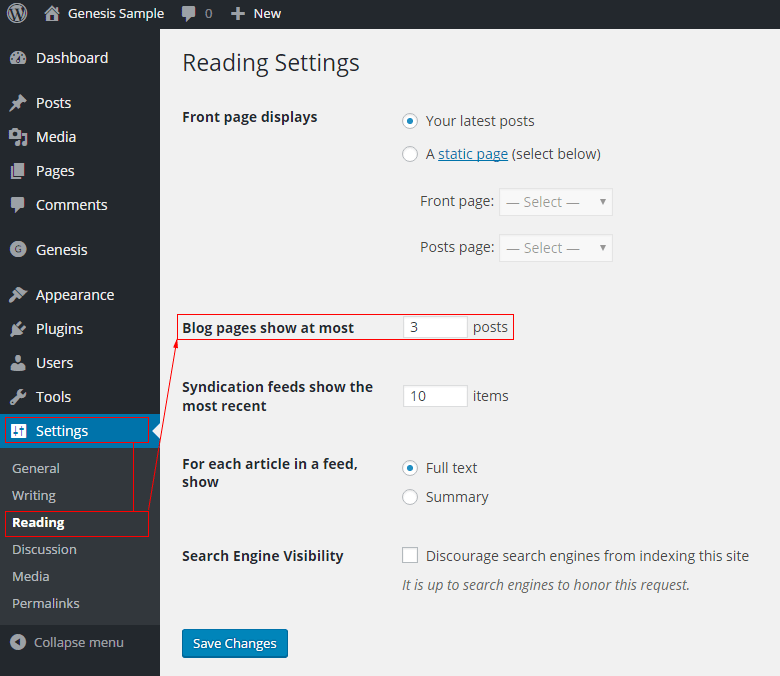 These settings only affect pages you make using the Blog Page Template provided by Genesis. These settings do not affect the home page of your website even if you set your home page to display your latest posts. Blog pages you make using the Genesis Blog Page Template can show posts from all of the categories on your site. Or you can limit the blog page to display just one category. Another option is to choose the “display all categories” option. But then exclude certain categories from your blog listing by adding their IDs as a comma separated list in the Exclude Categories dialogue box. Look in the URL bar at the top of your browser for ID=2 etc. Paste the IDs into the dialogue box as a comma separated list. This is the number of posts you want to appear on each blog post listings page. If you use Google Analytics, paste the code Google provides in the “Header Scripts” box. The Genesis Theme Settings page is quite short. If you practice with the different settings you’ll soon understand exactly what they all do and how to customize them to suit your own site. Settings > Reading > Blog pages show at most. This affects the number of blog posts that display on your front page. NOT the number of posts that appear on blog pages you make yourself using the Genesis Blog Page Template.